I think bake sales are a wonderful rite of passage for any child. They build people skills, selling skills, and counting skills. They teach kids to handle money. They teach patience and the relationship between setting a goal and working to make it happen. They give a child confidence and a great feeling of accomplishment. And when the money goes towards a good cause, bake sales teach kids about helping others less fortunate than themselves. That's a reward even sweeter than the cookies they sell! 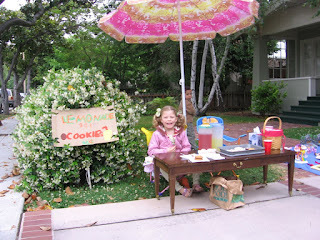 Over the years I've helped my kids organize a variety of bake sales. Some have been small, three-person stands to help them add some change to their piggy banks, others have been class-wide or community efforts that have raised hundreds of dollars for worthy causes. All have been lots of fun and great learning experiences, and it's something I encourage every parent to let their child try! For a couple of years now I've been hearing about The Great American Bake Sale, a campaign that encourages Americans to help end childhood hunger by holding bake sales in their communities. This year I was invited by C&H Sugar, one of the program's sponsors, to share some information about the program. 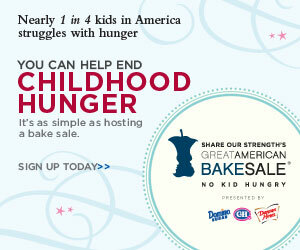 Since I love bake sales and I think ending childhood hunger is an important issue, I am more than happy to do so. For the third year in a row, C&H Sugar is the presenting sponsor for Share our Strength’s® Great American Bake Sale to help fight childhood hunger. Great American Bake Sale raises money to fight childhood hunger across the U.S. by encouraging individuals, families, organizations and schools to hold bake sales and donate the profits to help Share our Strength provide millions of meals and snacks to America’s children. You can go to C&H Sugar's Bake Sale page for all the tools you need to host a bake sale, including location ideas, information on how to promote the sale, printable signs, pricing suggestions, and of course, yummy recipes. You can also go to the Share our Strength Great American Bake Sale site for more tips, ways to get involved, even a photo contest where you can show off your bake sale moxie! C&H Sugar invited me to host my own Great American Bake Sale, and even sweetened the offer by providing me with a $20 Visa Gift Card -- but our weekend calendars are full this month, so I'm giving it away! That's right, C&H Sugar is providing one lucky Bonggamom Finds reader with a $20 Visa gift card to help a winner host their own Great American Bake Sale. Leave a comment on this post and tell me one thing you could do to help end childhood hunger in America. Maximum of 25 entries per person. This giveaway ends at midnight PST on May 20, 2010; I will draw a winner at random on May 21 and post the winner's name after the winner confirms acceptance. For additional giveaway rules, click here. Good luck! Disclosure: I did not receive a product sample or monetary compensation for this post. C&H Sugar provided the gift card that I am giving away on this post. The views and opinions expressed here are my own. We give food & baby formula to our local food bank. People never think about babies/toddlers when giving to a food bank & there is always a shortage of baby food, toddler friendly snacks & formula. I could donate extra food from my garden to the local food pantry. Garage sales a big hit this time of year. Our subdivision has one every May and giving the money made from the garage sale to charity for kids is a great way to teach kids about giving! One thing that can be done is to be a voice at your school and demand that the school's menu's reduce processed and nutritionally deficient foods and increase fresh and vitamin rich foods. donate to my local food bank! Buy foods: snacks, juice boxes, etc. when they are on sale and/or use coupons to buy them really cheap and then donate them to the food shelf. I entered the Aquafina giveaway! I donate to the local food bank. Volunteering at underprivileged area schools to provide kids with lunch or snacks can also help. I'm following on Blogger, crumbdonut. I entered the How to Train Your Dragon Giveaway. I donate to our church's food etc pantry! I could help volunteer garden at a garden in a food desert in the inner-city. I follow you on blogger/google friend connect! I entered your Suave Naturals giveaway! I buy things on sale with coupons and donate to the local food bank.Thanks! I can donate food to food banks and other local resources when I know I"m not going to use it! Donating food or money. Even a $1 goes a long way to helping end this. Thanks for the contest! We donate money and food to my work's food drive. I could give food to the local food bank. One thing we could all do is look out for people who live in our neighborhoods who need the extra help and either invite them for dinner or make extra meals to take around! I donate food and my time to our local homeless shelter it is right in town and they always need help. Donate canned foods to our local food shelter. I support school lunch programs and some schools' in my town have a breakfast program too. We give to our local food bank. I entered your Aquafina giveaway. I wrote on the Share Our Strength Facebook wall under the name Mary Happymommy. I wrote on the C&H Sugar Facebook wall under the name Mary Happymommy. I entered your Tropicana $50 GC giveaway. I wrote on your Facebook wall under the name Mary Happymommy. We could get our neighborhood to donate at least one thing a month. I wrote on the Share Our Strength facebook page as Sheila Newton. I wrote on the C&H sugar facebook page as Sheila Newton. I wrote on the Bonggamom Finds facebook page as Sheila Newton. I entered the $50 Visa giveaway also! I think most of us do our absolute best to help. I could donate food to end childhood hunger, and spread awareness because people still do not get it! I’m a Facebook Fan and commented Jennifer G.
I would help encourage people who live in poor neighborhoods to form community gardens, so as to grow their own food. That and a chicken coop in every backyard. We donate food to our church's food bank. Also, we sponsor a compassion child...so this is more of an international way to help end child hunger. I've donated food to the local food banks. I'm a teacher and we organize many food drives throughout the year, and I know they help those in our community less fortunate. We could plant a charity garden and give it to our local foodbank. We vote for liberal/progressive legislators who will advocate for the underallocated. We partipate in the annual food drive at our son's school every year. I could donate food and participate in bake sales. Donate food and have bake sales ever so often! Try to help identify at-risk children and encourage the schools to seek them out. If I would conserve more food by not making such big porportions that ultimately get pitched, and instead use the money wasted to donate to the hungry, it would help! I could involve my place of work in a fundraiser. I donate to the food pantry that my church hosts. I also help organize and donate to my local college's food drive. Donations by way of food for infants and children as well as financial contributions to local shelters help. Contributions to local churches and charitable organizations are always appreciated. Wrote on the Share Our Strength Facebook wall. Posted comment on Facebook wall. To help fight childhood hunger, I donate food and money to local food banks and have volunteered at a local farm to pick food for the community pantry and market to do my small part. Thanks! I coupon and stockpile, so i could donate my extras to local food banks! following you on networked blogs. my name: sarah u. Thanks for the giveaway...to help end childhood hunger in America, I think an individual should support community food banks in any way they can, on a regular basis i.e. donate foodstuffs, volunteer your time, and / or donate money when you can. ...commented on C&H Sugar Facebook page wall : "Bryan Eason"
...commented on Share Our Strength Facebook page wall: "Bryan Eason"
We can participate in the bake sale. I could donate more to a food pantry. I could donate more to our local food pantry. One thing that I do is to donate food to our local shelters. to my local food bank! I can donate to food pantries.